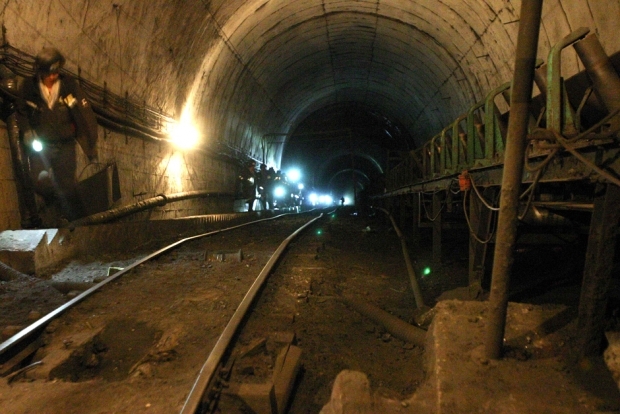 Inside a Wangjialing mine shaft in Shanxi province, 2010. By Wai-Shin Chan, director of climate-change strategy, Asia Pacific, for HSBC Global Research. This article was first published by chinadialogue. It is an inescapable truth that China needs coal—and that coal needs water. The coal industry, from mining to power generation and coal-to-chemicals, accounts for one-sixth of China’s water withdrawals. This is not sustainable and in some areas coal mining is already constrained. We believe China can achieve water sustainability in coal by adopting energy efficient growth policies and better technologies. If not, increasing coal-related water withdrawals will further constrain growth. In coal mining, water is predominantly used for cooling equipment, reducing dust levels, washing tunnels and extinguishing fires. In China, around 95% of coal is mined underground, so the process can damage aquifers as water is often pumped to the surface to avoid creating fissures, which can be dangerous for miners. If water from aquifer drainage is added to the amount used in regular mine operations, water withdrawals per ton of coal mined could be up to nine times higher. Coal is washed to improve its quality before being burned for power. The washing process reduces the levels of ash and sulphur, improving the energy content. It also reduces the weight of coal that needs to be transported and requires less desulphurization by the power industry—a process which uses some of the power generated (an example of parasitic power loss). It is possible to use dry cooling—using air—which requires less than a tenth of the water of a wet-cooled plant. By the end of 2010, only 5% of power generation in China involved dry cooling, all in water-scarce regions such as the northern provinces. Air cooled power plants are more expensive to build and incur parasitic power loss since they typically require around 10% of the energy produced to power the large fans. Investment decisions in the coal sector—whether by companies, investors or lenders—will increasingly have to factor in water-related risks. Anyone investing in or lending to a coal project today needs to know whether it may be water-constrained during the life of the project, be it in ten or twenty years. Increasing emphasis would have to be spent on assessing water risks.